2016 Audi Q7 3.0 TDI 218 review | What Car? The Audi Q7 is one of our favourite big SUVs, thanks to its blend of practicality, performance and plushness. Previously, we’d only sampled the 268bhp version of the 3.0-litre turbodiesel V6, an engine that proved powerful and refined but thirstier than the smaller-engined Volvo XC90. Now we've tried the 215bhp version of the same engine. If you can forgo performance figures that would shame many a hot hatch, you can not only save yourself £3000 but also make a slight improvement on the emissions and economy figures. It's good for a claimed average of 48.7mpg and emits 150g/km of CO2. The engine is available with SE and S line trims, and you can add all the expensive options you see fit. What is the 2016 Audi Q7 3.0 TDI 218 like to drive? You couldn’t ever call this SUV slow; Audi claims it'll cover the 0-62mph dash in 7.3secs and go on to a top speed of 134mph. It's also impressively flexible and and refined, which is more relevant to most people. When you start the Q7, there’s none of the gruffness and clatter you get from other diesels, and the engine stays smooth unless you really call upon all of its performance. It can start to sound strained when the rev-counter passes 3000rpm but it’s rare that you'll need to push it this hard. The standard eight-speed automatic gearbox is keen to shuffle up to the highest possible ratio; this usually keeps the engine spinning well below 2000rpm even at motorway speeds. For long distance driving it’s ideal. Our test car came with adaptive air suspension that allows you to raise or lower the ride height and adjust the firmness. Comfort mode soaks up all but the worst bumps at speed, although the soft suspension set-up means body control can be poor during sharp, fast cornering. Flick through to Dynamic mode and the car lowers and stiffens up. This improves body control greatly but also means you feel far more of the road’s surface. There’s a lot less roll and it’s slightly more keen to turn in to corners, but you’d never call it fun to drive. We would recommend sampling a Q7 on standard and air suspension, opt for the former and you’ll save yourself £2000. The Q7 is also easy to manoeuvre. Although the upswept side window profile can make it tough to see objects over your shoulder, it’s easy to work out where the four corners of the Q7 are. The optional rear view camera helped out greatly here. What is the 2016 Audi Q7 3.0 TDI 218 like inside? The Q7 offers plenty of room. Front-seat occupants will be spoilt no matter how tall they might be, and there's little danger of them clashing elbows. Both the seat and steering wheel have plenty of adjustment; getting comfortable won't be an issue. While the seats are a bit firm, they’re wide and generally comfortable. S-line models get part-leather, part-Alcantara seats as standard with full leather a £1100 optional extra. As we've come to expect from Audi, there's a sea of soft-touch plastics, high-quality metal trims and well-damped controls. All models receive Audi’s MMI infotainment system with Bluetooth connectivity, sat-nav, DAB radio and a 10-speaker stereo with an amplifier and subwoofer. To display everything, there’s a 7.0-inch screen between the dials and an 8.3in display that rises from the dash. Our test car was fitted with the technology pack that brings Audi’s virtual cockpit; a massive 12.3in LCD display that sits in front of the driver, replacing the dials. This can show vast amounts of information clearly and can be easily switched between viewing modes. Move to the rear of the cabin and the Q7 continues to impress. The middle row can be split 35/30/35 and can also be slid backwards and forwards to increase rear legroom or boot space. Not only do the outermost seats tilt forwards to allow people into the third row, they can also be made to recline. Both legroom and headroom are ample, even for those well over six feet tall. The third row is easily revealed thanks to standard electric operation that can be activated from the boot or rear passenger area. Assuming you’ve got the middle row slid forwards slightly, even adults can be squeezed into the rearmost seats for shortish journeys. On longer trips, the third row is probably best left for children. With all three rows of seats in place, luggage space is a usable 295 litres while in five-seat configuration this jumps to an impressive 770 litres. One of the advantages of the air suspension is the ability to lower the rear of the Q7 via a switch in the boot. This proves very useful when loading heavy items and will be handy for hitching a trailer, too. 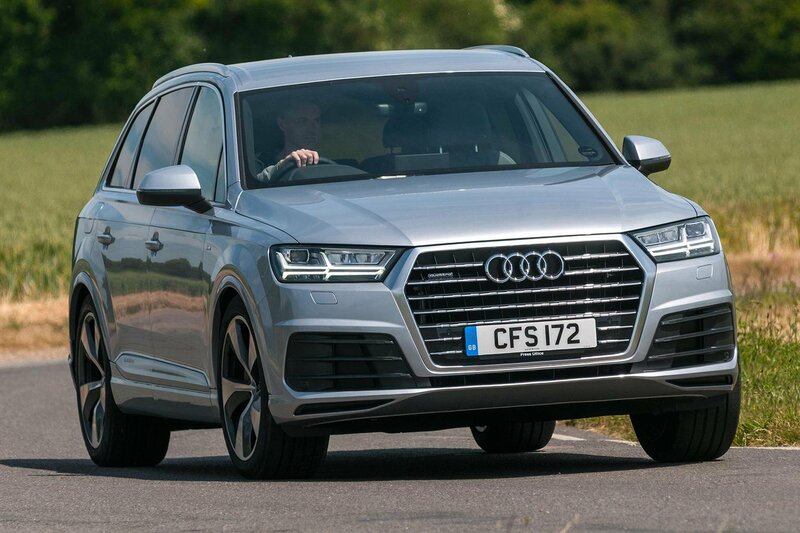 Revisiting the Q7 reconfirms all the reasons we’ve rated it so highly previously. The interior is a well-designed, high-quality environment that’s a joy to spend time in, and there’s plenty of room to boot. It may not be particularly exciting to drive but it is comfortable and exceedingly refined. While brilliant, we'd still suggest the more powerful 272 3.0 TDI makes more sense. The 218 might be marginally greener and less thirsty but the difference is just 3g/km and less than 1mpg. Both models are in the same tax bracket for business users and private individuals are unlikely to notice much difference in running costs. Even if outright performance isn't of interest, the more powerful diesel makes for even more flexible, relaxed driving. Furthermore, the additional £3000 for the more powerful engine seems more than reasonable at this SUV price bracket, and will be even more manageable when broken down on a finance package or company car tax.